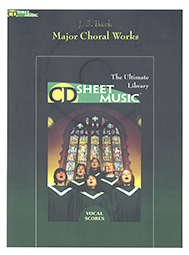 This 2 CD set contains the vocal scores of 16 Oratories and Odes. Included are Messiah, Israel in Egypt, Judas Maccabaeus, Ode to St. Cecelia's Day, all of the Coronation and Chandos anthems, Dettingen Te Deum, Utrecht Jubilate, and Te Deum. The 2 disks contain over 3700 pages of music with an alphabetical index of movements and an index arranged by voice types.